I hope you all had a happy Christmas. =) Now its time to ring in the new year! We are bringing in 2016 with a huge project. I am finally getting a new kitchen floor! During Christmas week, my husband's work place shuts down. Four years ago this week, we took that time to repaint the kitchen and add wainscoting on the walls. Two years ago we were going to replace the disgusting flooring, however, life got in the way. I was thrilled when Russ said we could do the floor this year! Woo hoo!! After weeks of researching and discussing our options, we decided to go with Snapstone porcelain tiles and chose the walnut planks. Eventually we will refinish the hard wood floor on the other side of the kitchen. Someday, someday, someday. A little bit at a time is how we roll. The half bath off the kitchen will have the same floor. He has it almost done. 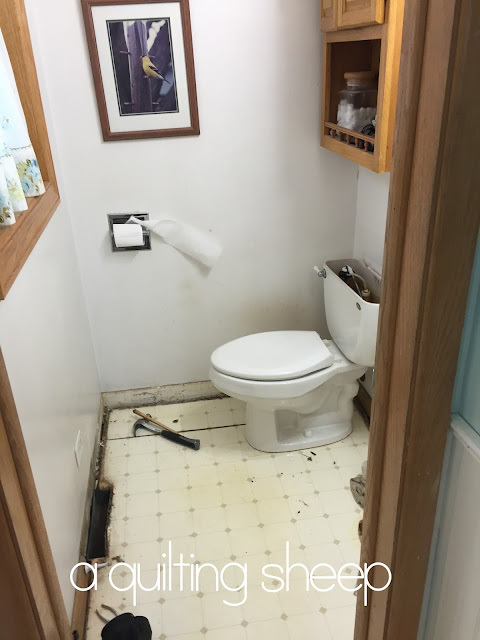 You can see the ugly flooring we had. See that black line? That is the vinyl floor seam and it separated, so that ugly black line was always there. Ugh...Eventually this bathroom will get a whole new makeover. I want to have tiles on the walls. That will take a year or two, probably. For now, a new floor makes me very happy! This is the area that will take some thought and planning. 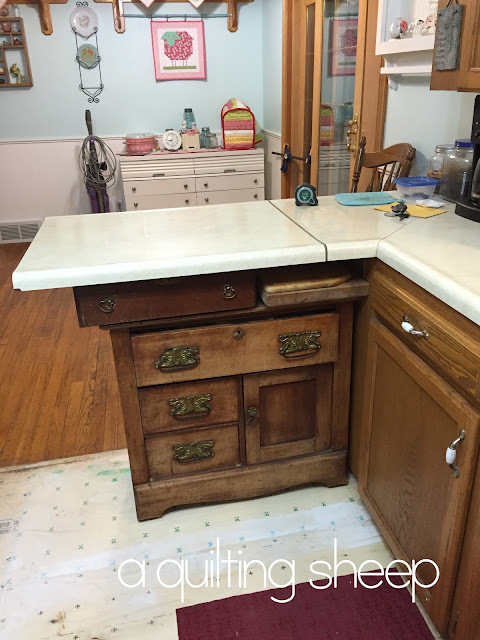 The former owners added this peninsula counter that could be flapped down to get it out of the way. In all the last 18 years I have lived here, I have never had it down. There isn't enough counter space without it. I jerry rigged up a solution to get more drawer space. The plan is to build a new cupboard area in the place of the cabinet that is there. I need drawers! We are exploring the options from Ikea cabinets, to unfinished cabinets that we paint, to transforming a dresser into a peninsula. We want it to look completely different from the cupboards because trying to match them would be difficult and then they won't ever look right. When that gets decided, new counters can go in. That's a whole other major decision! Now, if money were no object, the decision would be much easier. ;-) We will update the cupboards with new hardware, too. Just to give them a better look. That's what is going on around here! I haven't touched my sewing machine in weeks! I hope to get back to creating with fabric very soon! Have a happy new year, everyone! Thank you so much for your support and encouragement. =) I am very grateful for all of you! Truly! Happy New Year to you and Russ. Looks like you have lots of work ahead...all good I am sure. I could not help but notice the vintage sheet curtain in your bath. So cute. Happy Happy New Year! lots of work but in the end it will be worth it. thats how we roll around here also. a little at a time. I love that flooring!! It's gonna be so nice. Happy New Year!! I love it so far, Amy!! Happy New Year! I know how these projects take years and it is mostly budget at my house. Why spend a couple thousand to get the leaky shower fixed when we can use the hall shower? LOL, and oh my, we have a list of other things. Your bathroom tile is pretty but that black line is not pretty. I think the wood will look so nice in there. Your house looks so pretty. Your jerry rigging the kitchen counter is very good, and it looks pretty nice right there, I love the way you did that. This is going to be a good year! Happy New Year! I can relate. We do a little at a time, and float between rooms. Someday it will all be done. Your flooring is looking good. Happy New Year! It will be awesome when it all gets done. Looking forward to seeing your progress! Happy New Year! It is so exciting to redo a room isn't it. We painted the basement bathroom and put up a new light and mirror. I'm sure you will enjoy your kitchen when you get finished. I noticed a little sheep wall hanging, so cute!! I love the flooring you chose. We work just the way you do, a little at a time, and that is just fine with me. I think I appreciate things more when we take our time and think about the best way to do it. 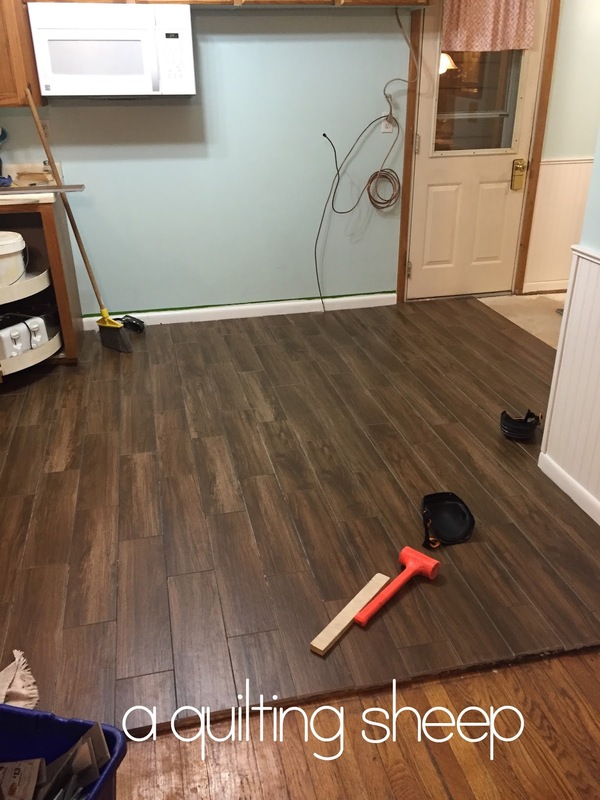 Your kitchen and bathroom will look great with their new floors. I sewed 19 pillow cases before Christmas and have not sewn since, I hope to get back to some of my projects soon. Happy New Year Amy! I love your new kitchen floor. It is so cool that they make though planks in ceramic. So much easier to clean up. Beautiful new kitchen floor - love the walnut finish on it. Your pictures bring back memories of the many updates we went through in our homes. Enjoy your new floor, in the new year :)! Wishing you a blessed New Year! Looks great! Have you thought of going to the ReStore for cabinets? I bet you would find some to match. You might have to go a few times, but they have them often, and I bet you could find some that match. It's been a long time since we've talked. I miss you! Oh well done!!! I had to laugh, we had an L-shaped kitchen and took it out when we re-finished. I hated it - you couldn't walk through when the fridge door was open. Now I have a galley style and LOVE it. We moved the fridge down, and put a much bigger cabinet between it and the stove, more than doubling my counter space. On the other side, we went with all drawers on the bottom cabinets, and I just love them so much, they really save my back. Hey Amy, I did a blog post just for you.....lol!!! Home improvements are always exciting! Love how the tile looks, great choice. That IS a huge project! It will look terrific when it is all said and done - like you're living in a new house!